In the past, there were minimum size criteria applied to businesses that were seeking invoice finance or factoring. Different providers would set the minimum size criterion at different levels, but used to reflect a fairly substantial volume of turnover, in order to make a facility viable. This practice is no longer the norm in all cases, with the emergence of selective invoice finance. A selective facility works in such a way that it gives the customer ability to choose invoices that they wish to receive prepayments against, and wish to receive a credit control service for - in the case of spot factoring. This means that there really are no minimum criteria anymore, for the size of turnover or number of invoices to be discounted. Most selective invoice finance providers operate in a way that allows the customer to terminate the facility at any time. So that means that you could discount a single invoice, and never use the service again. Some providers charge a set up fee, although this is not always the case, which warrants then putting the facility in place even if it is not regularly used. This means that even when we receive enquiries from small companies, turning over very small volumes, even new start ups, we are confident that we will be able to find them some form of funding. 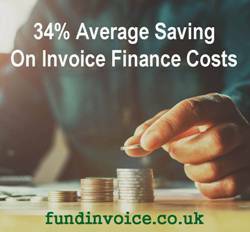 Minimum monthly fees are still used by many of the whole turnover invoice finance companies. However, our research has shown that there are dramatic differences between the approach taken and the levels at which these minimum fees are set, by different providers.